You can use the component & plugin JEmbedAll to sell individual files and / or packaged of files using Joomla sites. The configuration section of the component give you the option to configure this, and there are 3 steps for that, and the plugin embeds the necessary data into the public page (the frontend). There are by default 4 categories (4 different folders: audio, books, software, video) where you can upload your files in. You may need to rename them or create new ones to match the file categories you are selling. Go to Configure File downloads. Files list contains the list of the uploaded files. Use Add file / edit file to upload and later edit the name and path of the files. If there are more files in one package, by editing one file you can set some details (for example the link to a VirtueMart product) to all the files in the package. 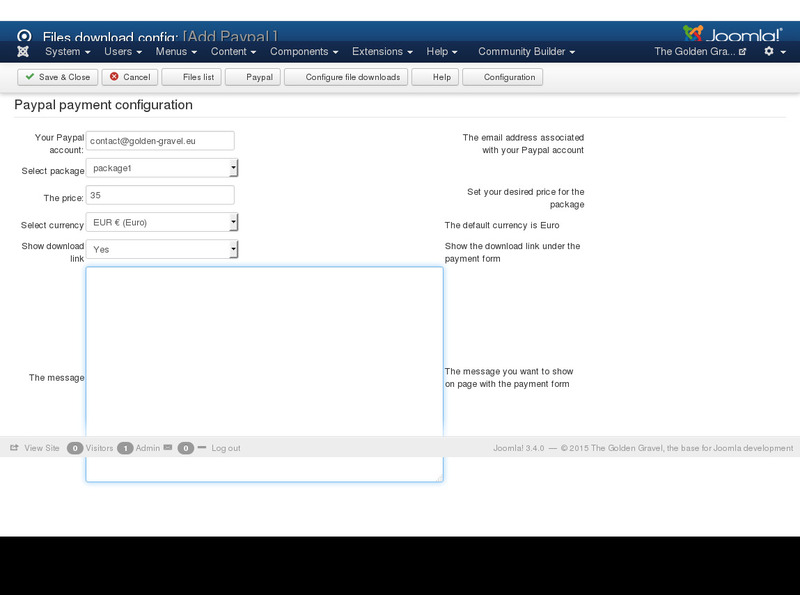 Go to Paypal in order to add, modify and configure the Paypal payments. The form looks like the following example: add the email you are using in Paypal, select the package, set the price and the currency, set the message you want to send to the people. In order to embed the Paypal payment on the Joomla site go into the administrator section, and add inside an article (or the HTML module, or into the script) the text [ paypal = 123 ] without spaces where the "123" is the ID of the payment - you pick it from the payments list. The JEmbedAll plugin will recognize the text and it will embed the data in the Joomla website. After the purchase check the email address used for Paypal payment, the files should have arrived attached into an email. It should contain 2 files: one installation package for Joomla 2.5 and one installation package for Joomla 3.x. If, somehow, the email does not arrive or you loose the packages you must return to this page and use your email address or Paypal transaction ID to access the download links via the form "Confirm purchase". How to configure & embed Paypal payments into your Joomla site - Golden Gravel, the best toolbox for #Joomla development: 5.0 out of 5 based on 1 reviews.